Little Wild Horse Slot Canyon in the San Rafael Swell is one of the most popular slot canyon hikes in Utah, and for good reason. The trail head is easily accessible and within a relatively short distance from the trail head the canyon narrows and the adventure begins. 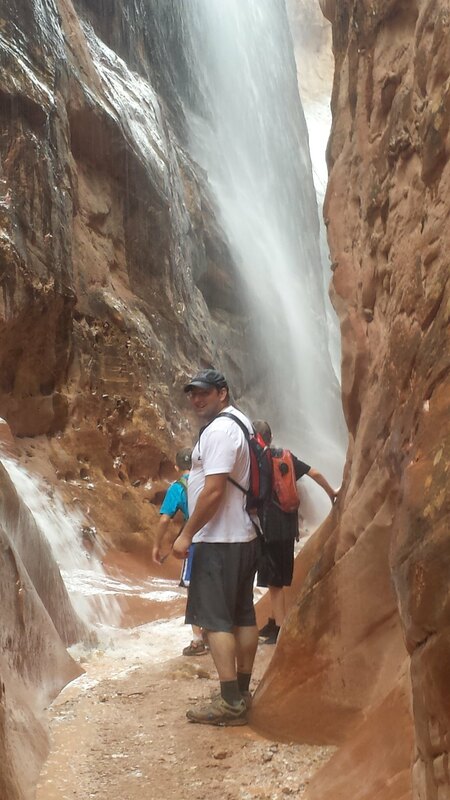 A rare experience to hike the canyon wet! This was our third time hiking this canyon. Normally the canyon is dry as there are very few areas for water to accumulate. If there is a storm the water tends to drain quickly so the hiking is easy and pretty drama free. This time however, we hiked the canyon with a %20 chance of rain. The day prior there was zero percent but being out of internet coverage that day left us a bit unprepared. The %20 panned out and we got a quick burst of rain that flooded the canyon. The video below shows how quickly things can get ugly as we were running back to find some less skilled hikers we had left behind. Luckily my wife knew what to do and when the rain started they found an opening slightly upstream from where they were to wait it out on higher ground. I was with my brother and my 2 boys and we were very relieved to see them safe in the opening after running back. This hike can be done in a loop if you combine Bell Canyon and a portion of the Behind The Reef Jeep Trail. Bell Canyon is nowhere near as spectacular as Little Wild Horse however and the distance to do the loop will have some frustrated. For a quick hike some like to just hike to the end of the slots of Little Wild Horse and back down. When the junction of Bell is reached you may decide to hike up Bell for a bit to add a little distance or just return to your vehicle. For those wanting the long hike, the loop is scenic and a good hike if you don't mind walking on the dirt road for a bit. For more pictures check out our Little Wild Horse Flickr Set. Difficulty: Easy, but the full loop will take considerable effort because of distance. or click for Directions To Trail Head from your location then follow the route on the map. Cool video. Glad you all made it out okay.